If you are interested in obtaining a Virginia death certificate between JUNE 14, 1912-1939, I would be glad to help you. If you need death certificates from 1940 to the present click on the Virginia link on the left for the state Office of Vital records. 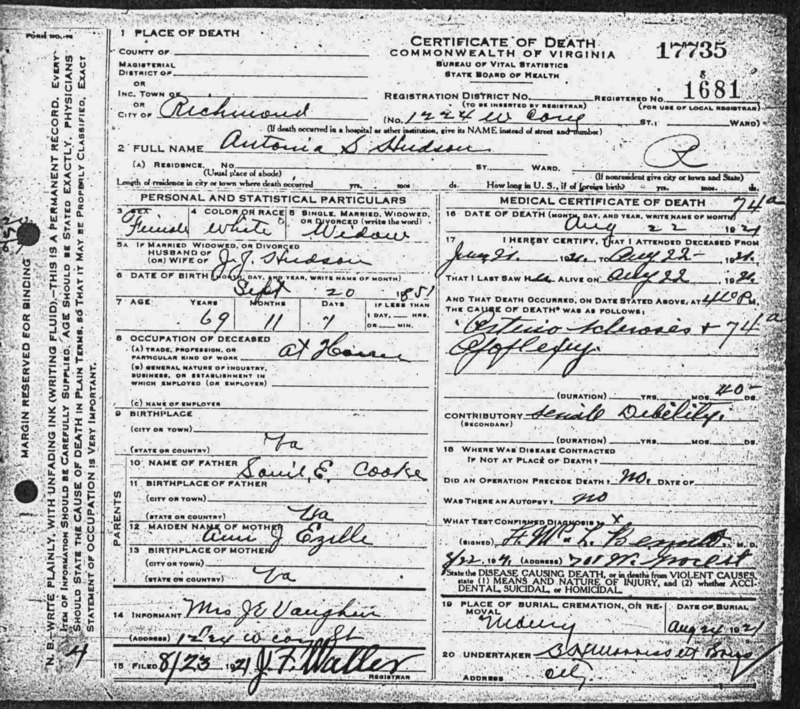 The state of Virginia did not have death certificates UNTIL June 14th,1912. They kept no state death records at all from 1897- June 13th,1912. I am just saying this because sometimes people will still write me for death certificates between 1897-1911 and there are none. Certain cities & counties kept their own records during that time but they are not available at LVA(except Richmond city) where I get the 1912-1939 death certificates. 1. Please send requests ONLY if you are serious about it and intend to pay for my fee(s). Most people do pay thank goodness. 2. Info I need is the date & place of death if you know them but if not do not worry about it. Even if I have date and place I still need to refer to the index for the volume and certificate numbers in order to find the copy. 3. I will take up to 10 certificate requests per person per month. 4. I am sorry, but I will only accept requests from persons living in the United States. 5. Please allow me up to a few weeks to get the certificate(s). As you can well imagine I am getting alot of requests most of the time now. And my time at the library in is limited to about 3-4 days a month. 6. I am not responsible if your envelope is lost in the mail. I keep receipts for when I sent the items and where they went, so if your item(s) do get lost, I can send you a copy of the receipt showing that I did indeed send it out. This has only happened once, thank goodness! However, the person did receive it eventually. The flat fee for EACH certificate search now is $10.00, this includes my searching up to 4 index reels(if necessary) the copy and postage costs. If copies are made I send them out in a nice 9 X 10 manilla envelope. As I understand from some workers for the postal service these manilla envelopes can take a few days longer than the regular business sized envelope will take to be delivered, so I thank you in advance for your patience waiting for the envelope, please give them at least 7 business days to arrive. The fee is $10.00 whether or not I find the certificate, and still the same fee even if you have the volume and certificate numbers, because it is a flat fee. Now I ask that people send payment in advance of my doing the search(es). I will hold onto the payments until the searches are done. Most people pay in a fair time period, but I have had some who have not paid me at all and I need the money as that is one of the reasons I am doing this. Thank you. I do the searches from microfilms at the Library of Virginia through my own research. My name is Beth and I thank you! Copyright ©2000-2016 by M. E. Bond. Some of my ancestors buried there. Cemetery having been vandalized now great people working hard to restore it! Please read all information on this page before sending requests. Thank you.